Bonus: For more information on how to properly blow a short reed goose call please click here – goose calling video. 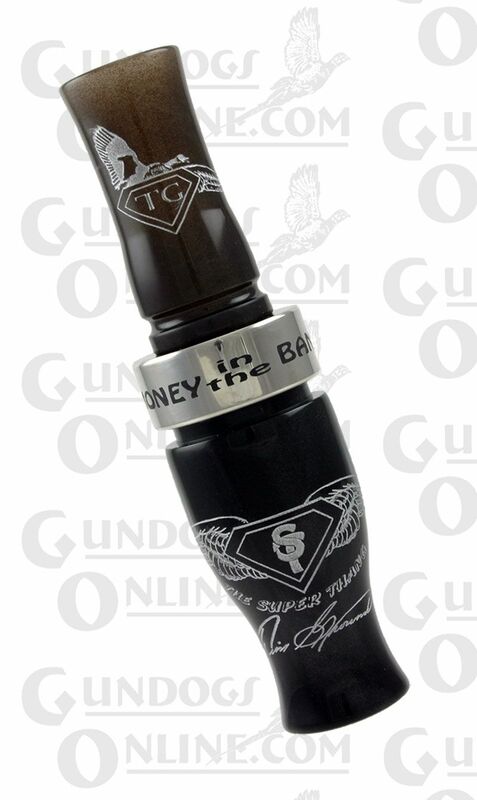 Tim Grounds has done it again with his ultimate short reed goose call on the market today, the Super Thang. This call is made of Acrylic and has no problem hitting those hard to reach high end tones as well as the deep tones. This call is, of course, hand tuned by Tim. Triple Crown Guts - found exclusively in Tim Grounds Championship Calls. Available in the Triple Crown Super Mag, the Real Thang and now the Super Thang. This call boasts the all new Triple Crown Gut System created by Tim Grounds and Kelley Powers. They are exact replicas of the worn-in and hand tuned guts used in Kelley Powers Contest Call. What has been previously kept as a secret for years by the top contest callers in the world, is now available to the public exclusively in select Tim Grounds Championship Calls. When a new goose call is purchased, one of the main ways to make the call to sound better is to eventually wear in the guts. This wearing in occurs as the reed vibrates during calling and eventually forms a channel in the tone board. Usually, the deeper the channel the better, and more powerful the sound. The problem is, this process takes years and years to form a noticeable difference. Powers and Grounds have taken, arguably the most worn-in set of guts on the planet, from the only “Triple Crown” winning call (World Champion, World Champion of Champions, and International Champion), Kelley Powers Contest Call, and duplicated them for the public. The original tone board can be credited for winning close to a quarter of a million dollars overall!! These new guts are made out of the super crisp glass composite material. You’ll have to try them to believe it!! An amazingly realistic and distinct sound right out of the box!!"